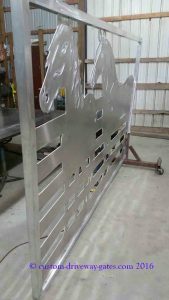 Aluminum Gate Design | Custom Los Angeles Horse Theme by JDR Metal Art - Custom Driveway Gates - Iron Steel & Aluminum - JDR Metal Art - FREE Standard Shipping! 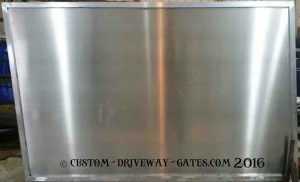 These aluminum driveway gates were custom designed for a Los Angeles, California residence. 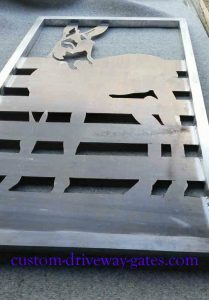 The design features four horses and a donkey which are plasma cut from heavy-duty aluminum sheet metal. The main obstacle for this project was working with a sloping driveway entrance that made it necessary to rack the gate design to accommodate the drop in altitude from the right side of the entrance to the left side. 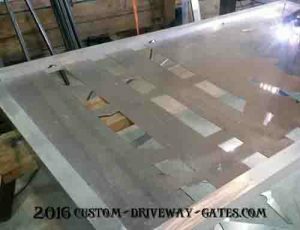 We dropped the left side of the main driveway gate design down just a bit over 20 inches so that the gates will run at a parallel angle to grade. 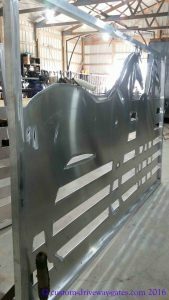 All the details were coordinated in advance with the measurements being provided by our client’s local Los Angeles expert security gate & fence contractor. Another concern for our client was that she did not want her dogs to be able to squeeze through the gates. 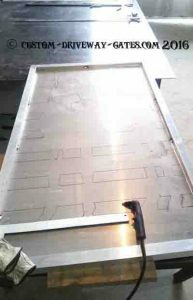 We allowed a 3 inch gap between the horizontal boards seen in the design, with each board being 5 inches tall. 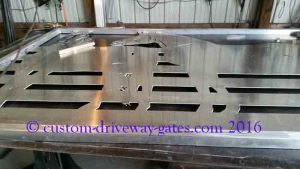 The walkway gate to the far left of the entrance is made with a 2x2x1/4″ square tubing frame and 1/8″ thick marine grade aluminum sheet metal. 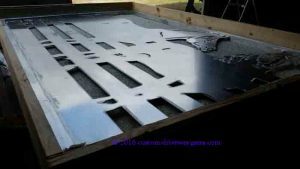 Laid Out & Ready to Plasma Cut! 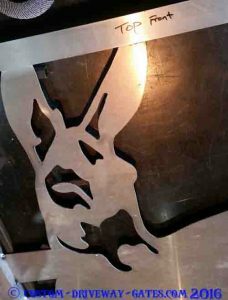 The details of the donkey silhouette are cut out with a hand torch. 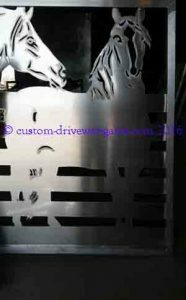 We also have CNC plasma, CNC laser and CNC water jet capabilities for gate projects which involve cutting larger quantities of our beautiful fence and gate designs. 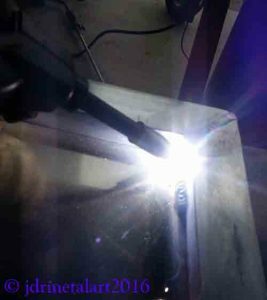 This gate was welded together using an aluminum spoolgun welder. 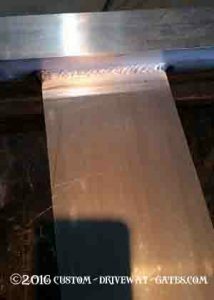 Aluminum is relatively soft and has a low melting point compared to steel which makes it more difficult to weld. 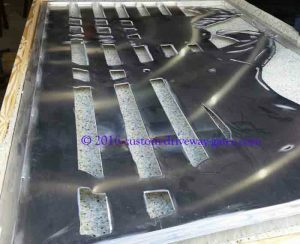 The weld puddle needs to be moved very fast to prevent burn-through and weakening of overheated areas. 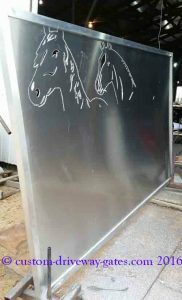 This is what the left gate panel looked like when it was a blank sheet prior to layout of the horse design. 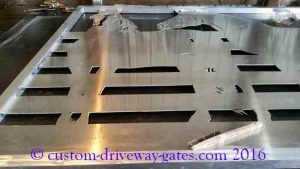 We built the gate frame with 2x2x1/4″ aluminum square tube and the sheet is 3/16″ marine grade aluminum alloy. You can see the side rails are angled to account for the slope of the driveway. 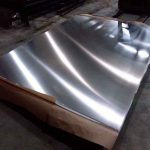 It was definitely a different feeling to be making something OUT of square…we were doing a lot of double checking to make sure we stayed on the right track! 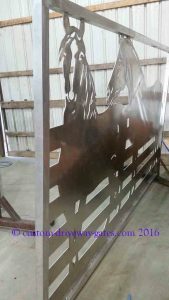 Plasma cutting the horse designs is a lot of fun. 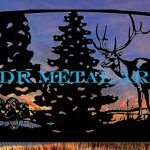 The aluminum cuts nicely with a plasma cutter and is much cleaner to work with than steel.